Twin-engine Porsches created by Lou Fageol, whose father Frank founded the Twin Coach Company in 1927 to develop a large capacity dual-engine bus to challenge street cars for city transit. In addition to considerable success as pilot of Gold Cup hydroplanes Slo-Mo-Shun IV and V, Lou built a dual Offy powered Fageol Twin Special that started the 1946 Indy 500 from the middle of the front row. His double engine obsession continued with the Fageol Twin Porsches. Top photo shows the original car with 356 coupe body and '51-2 Packard grille (and tail lights?) 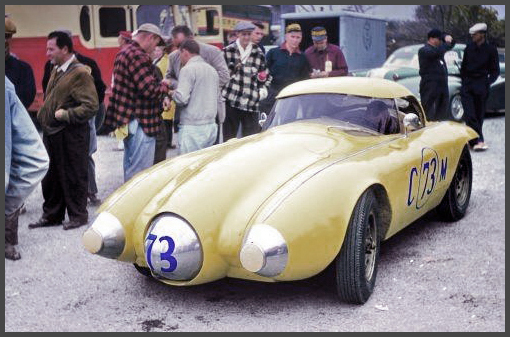 in early August 1953 @ Paine Field in Everett, Washington, during SCCA races held as part of the annual Seattle Seafair celebration. 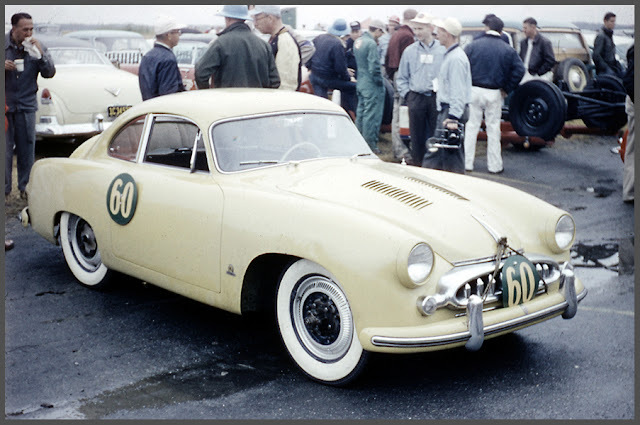 Lower photo from Don Zipfel via Hemmings @ Pebble Beach April 1955 shows a more radical second car, constructed from airplane drop tanks on a box channel frame with Porsche suspension bits.